A guilty liberal finally snaps, swears off plastic, goes organic, becomes a bicycle nut, turns off his power, and generally becomes a tree-hugging lunatic who tries to save the polar bears and the rest of the planet from environmental catastrophe while dragging his baby daughter and Prada-wearing, Four Seasons–loving wife along for the ride. And that's just the beginning. 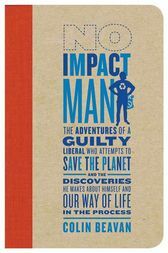 Bill McKibben meets Bill Bryson in this seriously engaging look at one man's decision to put his money where his mouth is and go off the grid for one year—while still living in New York City—to see if it's possible to make no net impact on the environment. In other words, no trash, no toxins in the water, no elevators, no subway, no products in packaging, no air-conditioning, no television . . .
What would it be like to try to live a no-impact lifestyle? Is it possible? Could it catch on? Is living this way more satisfying or less satisfying? Harder or easier? Is it worthwhile or senseless? Are we all doomed or can our culture reduce the barriers to sustainable living so it becomes as easy as falling off a log? These are the questions at the heart of this whole mad endeavor, via which Colin Beavan hopes to explain to the rest of us how we can realistically live a more "eco-effective" and by turns more content life in an age of inconvenient truths. “Colin Beavan has the disarming and uniquely remedial ability to make you laugh while he's making you feel like a swine, and what's more, to make you not only want to, but to actually do something, about it.” —Norah Vincent, author of Voluntary Madness"